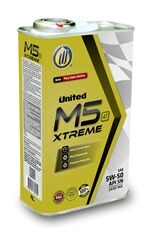 M5 XTREME 4T 5W-50 is a new fully synthetic 4-T motorcycle oil that delivers the latest development in lubricating oil technology to maximize the protection for the newest performance engines. Reinforced with a powerful additive package, as well as having Polyalphaolefins (PAO) content, it meets the highest API SN performance level and exceeds most demanding requirements in relation to modern engine’s emission control as well as oil consumption. In the energy-conscious era of today, M5 XTREME 4T 5W-50 motorcycle oil has also been designed to maximise fuel efficiency.